The first images we see are from my graphic design 3 class. The project was to create a basic cover, inside cover, table of contents, and four double page spreads, to showcase my idea of an anatomy textbook. The cover page is painted using brushes on photoshop and hours of blending and discovering new ways to generate imagery. The rest of the pages are focused on the layout of the text, and the general flow of the pages. I learned a lot about how to create a functional textbook that is easy to understand and easy to follow. You may notice the name on the book is Sirianni. Sirianni will be the name I take when I decide to get married, also my maiden ( Bewersdorf) was too long and looked more awkward in the title and other pages. This was my favorite project in College, and I spent countless hours observing multiple textbooks as references. Branching out through my PLN or Personal Learning Network, which we accomplish through using social media like Twitter. I never had Twitter before entering the interdisciplinary studies program. The first semester I didn’t understand how to use twitter, so I didn’t tweet much or follow anyone. This semester was different though. I tweeted every day, I followed people in my field, I contacted all the major people in the network, and I gained some recognition for myself. I have a network of people who can help me when I don’t know what I am doing in the field. I am building up my contacts and making connections with people across the country. I even made contact with a retired medical illustrator who offered me some insight into the field. He told me to study the computer aspect of medical illustration as it will give me a better leg up in the field. Helping a fellow colleague out! @kateburgess42 took so long to remember your name, I FOUND SOMETHING COOL FOR YOU!!! https://t.co/qO4WhsLM7H Watch this dude do his thing!! Fan Girling about some of my favorite historical Medical Illustrators! https://t.co/yfN1glcnoa Ahh I JUST DIED AND WENT TO HEAVEN Frank H Netter was exhibited in the worlds fair! He made a transparent woman and showed how her glands secreting hormones helped to change the woman from puberty to maternity! If you know where to see this please tell! Talking about medical art history, and correcting someone on their knowledge. Sharing some very funny Illustrations from history. Listening to James Pickering on Medicine. Learning about current topics in the field. Doctors offices are a great place for inspiration. My Plymouth State University Interdisciplinary Studies major has never been done before. I am honored to have had the privilege to create something tailored to my needs for education. I study the process of turning complex anatomy into images, practical, but beautiful images to help teach the inner workings of the body. My major is Interdisciplinary Studies in Medical Illustration. I study Biology and Fine Art. My Applied piece was the process of taking images of the body in motion and seeing past the skin to the musculature underneath.I wanted to show them how amazing the body can be, not how sick we can become. I did not want to focus on our mortality. I wanted to take something that I feel is amazing and is a curiosity, and share it through a window that encompasses my passion for the human body. The ability of the human body should be celebrated, and understood, as there are no limits. I thought when I started my education, that there were a few limits I would have to be wary of, but then I found Interdisciplinary studies, I found Robin DeRosa, who told me, there are no boundaries, just a difficult terrain that will help shape me into the person I dreamed of being. I wanted to share that same epistemology with the world. Shame on those who say you can be whatever you want to be, then tell you to get a job with benefits outside your field. If there is a will, there is a way, and I have both. This being my state of mind, I applied all my knowledge learned from countless lecture, and Lab hours and I put my mind to the task. Paying attention to the directionality of the muscle and the structure and physiology of the anatomy. This helped me understand exactly what it is that I wanted to do. It was a trial run, in a way, of what I would spend the rest of my life doing. I had to apply all the information of the musculature that I had attained in my studies of Anatomy and Physiology. Not only did I have to understand the placement of the muscles; i.e. origin and insertion, but I needed to understand the chemical makeup of the muscles. The four years that it took for me to learn my own hand and its abilities applied to art were put to the test. My understanding of pigment to solvent ratio helped me make definitive marks on the paper. I had to cast my timidness and fear to the eraser shavings and just do what I had been trained to do; to see, and to replicate. I was taught that I should be able to draw a figure falling from a high tower, and be able to recreate its gesture before it hit the ground; this, I had learned, this is how I gained my hand. Scratching vine charcoal into paper, make the mark, drop the paper, start over. Repeating this process till I felt I had gone mad, but this taught me not to hesitate or question my hand’s ability. The research piece I wrote helped me to become more grounded in my field. I decided to map out the history and evolution of medical illustration. I wanted to understand my roots a little more and shed some light on the field I am joining. I wanted to know the humble beginnings of the people I have idolized like Frank H Netter and Max Brödel. I wanted to know who really was the first person to conceptualize that this muscle does this, and the gallbladder does this. I wanted to share with everyone, a students journey through the evolution of the field of Medical Illustration. I started in the caves of Northern Spain and ended here in the United States, but I tell you I traveled all over the world on my computer and in my mind. I found the hidden gems of antiquity, buried under rubble in what is now Egypt. I discovered that there is a proper appreciation for medical illustration in Art History, but it is mild and can only be found in little niches. The education I found for myself among the copious amounts of research that I had read through is something I could never have learned in any classroom. I learned art history, world history, scientific discoveries, plagues, and quite a bit of respect for renaissance medical illustrators. I learned what disciplines are necessary for my success. Combining all the tools I gained from both my Research Article and my Applied Piece I find that I have opened a path for further education. I have answered many of my questions and found new questions to ask. I find myself heading more towards research and modern branches of medical illustration. I took what I learned from my research and applied it in my applied piece, which I am continuing. I have a group of Interdisciplinary studies students who want to create an IDS art collective for those who incorporate fine art into their degree contract. Medical illustration is a way of mapping and communicating complex anatomical structures found in the human body. This form of art is used to direct students in their dissection labs. It is used to teach anatomy without having a cadaver in front of you. It is used to diagnose patients, and solve court cases. Medical illustration allows the hypothetical to occur without the damage of applying it to the real world. Medical illustration has been a practice for as long as beings have practiced mark making. Medical illustration as a discipline consists of a rare grouping of other extant fields. Communication is key in the field of medical illustration, so is our initial understanding of the subject or the human body. Knowing Biology, Physiology, Neurology, Anatomy, and Histology. Extensive experience in artistic endeavors along with an understanding of aesthetics is crucial to achieving success in this field. Publication knowledge, Health promotion, Archeology, Anthropology, Chemistry, Linguistics, and Psychology add up to smooth and shape the field of Medical Illustration. Medical illustration is a discipline of many disciplines. The knowledge required for this profession are vast and numerous, but it makes for a beautiful multidisciplinary study which blends together creating a language that cannot be spoken, only seen. Red Mammoth, Berenguer. 1994, Cueva Del Pindal, Cantabria, Spain. Spain in a small cave outside the town of Pimiango near the border of Cantabria. 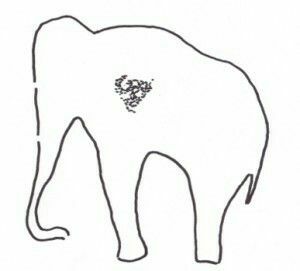 The illustration was of a mammoth painted with red ink. “Prehistoric painters used the pigments available in the vicinity. These pigments were the so-called earth pigments, (minerals limonite and hematite, red ochre, yellow ochreand umber), charcoal from the fire (carbon black), burnt bones (bone black) and white from grounded calcite (lime white)”(WebExhibits). The people of the caves used lumps of clay-rich Iron, dried and crushed into a fine powder. They would then mix it with a binding agent such as animal fats, urine, water, vegetable juices, and albumen. There were many ways in which they would apply the paint, but in this case, it was probably the use of sticks to create a linear outline of a great mammoth using red ocher and dabbing in the heart possibly using their fingers. This illustration was likely used to teach young hunters the best place to injure the mammoth: the heart. Though there was little understanding of anatomy and physiology at that time, this was one of the first documented pieces of medical illustration. In order for physicians to understand the intricate workings of the human anatomy, without the use of current technologies, one would have to dissect a human being. There were private dissections performed for the discovery of an untimely death, called autopsies. There were private dissections for teaching young physicians as well. Public dissections were utilized in the Alexandrian school of medicine started by Erisistratus and Herophilus, but due to legal and religious reasons, it was prohibited in 200 AD. But public dissections were reintroduced by an Italian physician named Mondino de Luzzi in January 1315. We start with one of the most established early physicians, Aelius Galenus (Sept. 129 AD- c. 210 AD). He influenced the development of many medical disciplines such as the study of; anatomy, physiology, pathology, pharmacology, and neurology. He is most well known for his theory of the four humors, which was used to determine the ailments of patient well into the middle ages. The four humors consisted of black bile, yellow bile, phlegm, and blood. His teachings set the stage for physicians and medical illustrators to take an interest in the pictorial documentation of medicinal discoveries. Starting with Erasistratus and Herophilos. Erasistratus, father of physiology and Herophilos, father of anatomy. Both were Greek physicians and created the first school of anatomy in Alexandria, Egypt. This was in the 3rd century BCE. They were also among the first physicians to utilize illustrations in their methods of teaching. Benjamin Mandel M.D shared in his presentation of historical medical illustration an image that was produced from the school of Anatomy in Alexandria, Egypt. Sadly the school was destroyed in a fire in 391 BC along with the exquisite library. “It appears that he (Herophilos) wrote three treatises devoted to anatomy, one to midwifery, two each to the study of the pulse and to therapeutics, one to ophthalmology and one to dietetics. None of his works have been preserved, they disappeared with the destruction of the library of Alexandria.”(Reverón). There were five squatting figures, each displayed the different systems in the body. The images were semi-schematic in that the images had bold outlines, poor details, and many technical errors. The images were used for memorization purposes only, not for understanding how the parts sit together within the body. There are three distinct approaches to visually communicating information about the body; Naturalistic, Semi-schematic, and Schematic. Most of the illustrations found in antiquity are semi-schematic and schematic. Much like the early illustrations from classical antiquity. They are maximally simplified, purely symbolic, abstracted and are impossible to interpret due to the lack of context. these images were not by any means exact and were more just a theory of the physiology of the organs. Iluminure form the Hunayn ibn-Ishaq al-‘Ibadi manuscript of the Isagoge. Hunayn ibn Ishaq was a Mesopotamian physician who produced an anatomical atlas on the workings of the eyes, it was titled Book of the Ten treatises of the eye. His work was used later in the middle ages by ophthalmologists. This semi-schematic illustration of the eye is rudimentary but quite accurate.The parts are all present, however, the parts of the eye are disproportionate. the image seems representational, though quite abstract. There is a success in that the drawing accurately depicts the parts of the eye, and can be used to navigate the physical eye of a patient. Ishaq was heavily influenced by the Greek physician Galen, and his illustration stays true to Galen’s style of teaching. Hunayn influenced another early medical illustrator, Ibn al-Nafis. Idn al-Nafis, (full name Ala al-Din Abu al-Hassan Ali Ibn Abi-Hazm al-Qarshi al-Dimashqi), was an Arab physician who made many contributions to the understanding of Pulmonary circulation. Ibn al-Nafis“was the first person to challenge the long-held contention of the Galen School that blood could pass through the cardiac interventricular septum, and in keeping with this he believed that all the blood that reached the left ventricle passed through the lung.”(West). Here we start to see the illustration of full-bodied subjects. This is stylistically described as a schematic. Notice that the figure is in a squatting position, this is most likely due to the fact that the cadaver was sat up on a stool for the illustrator. The figure is quite disproportionate, much like the majority of early medical illustrations. The veins and arteries are drawn without any true direction other than away from the body, which they in fact are. The organ structures within the body cavity are quite like the veins and arteries, in that the masses of the tissue are drawn proportionately, but the physiology is not quite developed. Moving to Asia now, Shou Hua’s book Jushikei hakki. The author lived in 1304-1386. You can tell that the image is quite minimal, and it lacks detail. This would not be useful to a physician in instances where the internal body needs a reference. However, in this specific photo, the acupuncture is the implied use of this reference table. The proportions of this figure are arguably inaccurate, but this style is pretty typical of early medical illustration. Shou Hua. locations and characteristics of meridians and acupuncture points. As for the full body image, we find that it would be difficult to pinpoint where these labeled areas are in relation to the anatomy. It seems there are no reference areas to the bones or muscles that could help us find the area that is indicated. Regardless, the use of indication lines in this specific illustration is before their time, as medical illustrators had not begun to utilize this technique until after the 1500’s. One boundary that makes this a difficult piece to understand is the language barrier. Japanese is not a common language for most. Though there is a translation, the title of the Atlas itself was graciously translated by the National Library of Medicine as Expression of the fourteen meridians. An Iranian illustrator Mansur Ibn Ilyas, published his atlas titled Tashrih-i Badan-i Insan. In English, it means Anatomy of the Human Body. The Atlas was published in 1390 just a bit after Shou Hua published his. I read up about this particular artist and his inspiration, which brought me on a trail of rich middle eastern illustrators that I would have never found if not for this Author. Mansur Ibn Ilyas was from the providence of Fars in central Persia, modern day Shiraz, Iran. The illustrations from this book were commissioned by Zayn al-Abidin, a politician in the last Muzaffarid ruler of Fars. Arterial and nervous systems as viewed from behind. From: Mansur ibn Ilyas: Tashrīḥ-i Badan-i insān. تشريح بدن انسان. Manuscript, ca. 1450, U.S. National Library of Medicine. This particular illustration is concerning the arterial, and nervous systems. Notice the squatting figure, which I had mentioned previously. This is because the cadaver is commonly propped up on a stool during the dissections. This is another semi-schematic illustration, very common of the illustrations during this time period; the full body, disproportions, the description is written on the illustration as opposed to the indication lines. The indication lines are seen in the previous illustration above, which would point to the specific parts, freeing up space for the viewer to actually see the illustration and understand the significance of that structure. This illustration is a schematic drawing, with very disproportionate structures, basic shapes representing the face. As you can see, the head is a literal circle, with circular cheeks, and the proportions of the eyes, nose, and mouth being quite small in comparison to full size of the head. The vertebra is accurately labeled, but the positioning of them stacked on top of one another doesn’t give the viewer the best understanding of where the nerves connect to the peripheral nervous system (or spinal cord). The limbs seem to have an unnatural wave to them as if something was under the skin of the figure. Still, this illustration does show a map of some of the nerves, and where they protrude from the peripheral nervous system. Magnus Hundt was a German physician, theologist, and philosopher, and coined the term anthropology. He published an anatomical atlas called Antropologium de hominis dignitate, natura et proprietatibus, de elementis, partibus et membris humani corporis, in 1501. Hudnt’s atlas, commonly referred to as antropologium for short, contains 17 woodcut illustrations of human anatomy. From Magnus Hundt’s Antropologium de hominis dignitate. (Bologna, 1523). A process of printmaking which allows the illustrator to make more than one print, allowing for multiple atlases to be published. This print is pre-Davinci, so there was no such thing as a cross-section, which is what Hundt seems to have been trying to do. Perspective and the ability to draw from a foreshortened view had not quite been established yet. I was not understood conceptually until the Renaissance. The Renaissance artist found themselves beginning to reject Galen’s authority and revisit the classical Greek art. These artists wanted realistic images that were accurate enough to understand the inner workings of the human anatomy i.e. muscles. Hieronymus Brunschwig (1450-1512), Jacopo Berengario da Carpi (1460-1530), Albrecht Durer (1471-1528), and Charles Estienne (1504-1564) were the next to publish their anatomical atlases. Brunschwig’s work was still very simple and more naturalistic. His style is much like the art from the middle ages, not quite a renaissance style, but the understanding of proportions is beginning to develop. 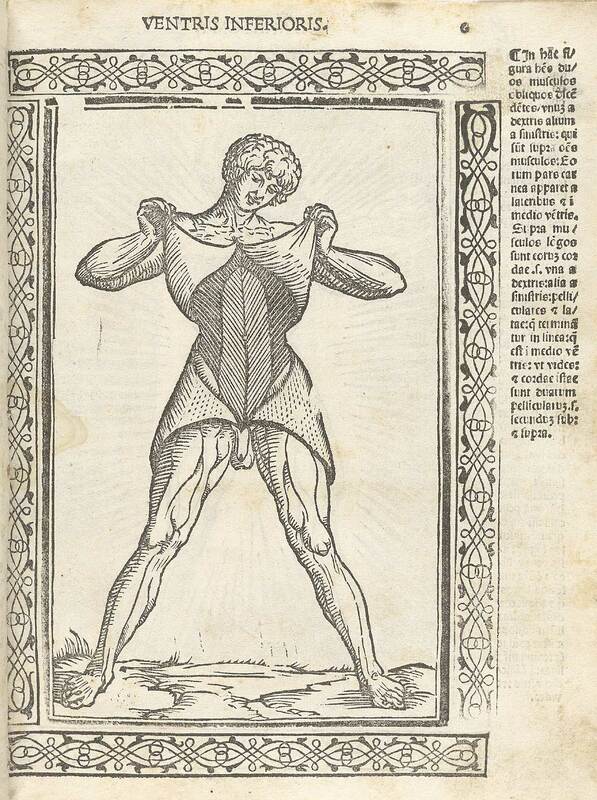 Anatomical illustration from ‘Isagogae breues, perlucidae ac uberrimae, in anatomiam humani corporis a communi medicorum academia usitatam’ by Jacopo Berengario da Carpi, Bologna 1523. .
Jacopo Berengario da Carpi was famous for his illustrations depicting the human form with its skin peeled back to show the muscles underneath. Jacopo seems to be coming away from the semi-schematic approach which was popular during the middle ages and heading in a more popular naturalistic style. However what we find in full-bodied figures is a lack of detail. This image is rich in detail, however, the image is too small for one to really see the details, and there is quite a bit going on within the image itself. There is a lack of understanding of the anatomy of the image, as the value is not consistent with the value structure seen in the leg muscles. Charles Estienne’s Atlas De dissection partium corporis humani libri tres was illustrated by possibly 3-4 different artists. Jean “Mercure” Jollat (1490-1550), Estienne de la Riviere (?-1569), Pietro Buonaccorsi (1501-1547). Each had a similar style, close enough for the images to match in the atlas. Estienne de la Riviere was the artist, and Jollat was the engraver. Some of the images from this atlas are very well executed. However, once more, the issue with using a full-bodied figure is the chance of losing the image into much detail in such a small space. The first image is a great example of a well-executed full figure. The value in the skeleton enough to distinguish the structures from the foreground, and really draw your attention in. The negative space has been taken up by a scenic view, which is typical of naturalistic illustrations. However, another illustration from the same text seems to lose the impressive value structure found in the skeletal illustration. This image depicts the musculature of the posterior view of the figure. 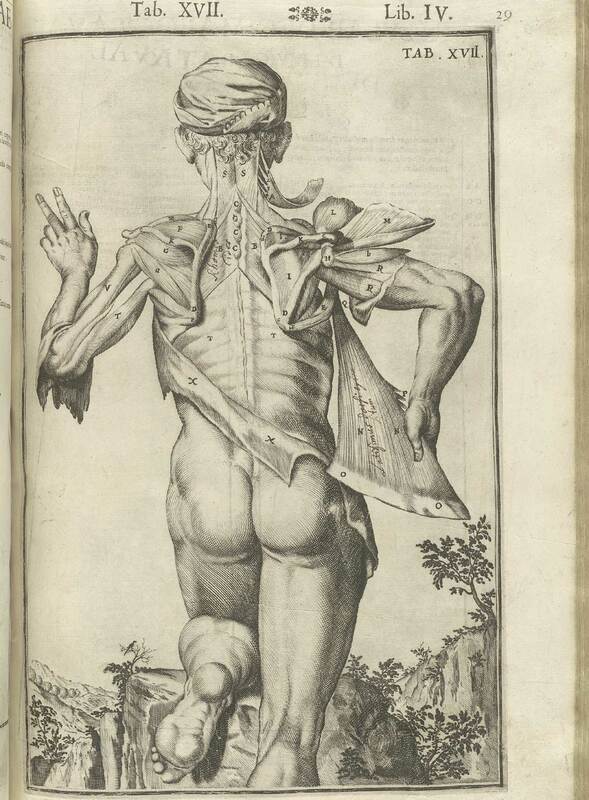 Muscle figure from Charles Estiennes’ De dissectione partium corporis humani libri tres. The value structure is not as evident in this particular image, which is due to the intricate line work of the musculature, which can only be seen upon closer examination of the image.This particular image is an example of how the full-bodied figure can cause problems in how an artist executes their image. Naturalistic styles can help or hurt an image. In some cases, such as those from early Roman pictures, there is said to be “an overabundance of visual baggage.” and that the key is not to allow an overabundance of figures flood the scene giving “little chance for the focal point to receive adequate attention” (Loechel). “On Sunday 26 April 1478, Giuliano de’ Medici was murdered as he attended High Mass in Florence’s cathedral of Santa Maria del Fiore…On 28 December 1478, he (Bernardo di Bandino Baroncelli) was hanged publicly in Florence. Bernardo’s public execution is famously recorded in Leonardo da Vinci’s pen-and-ink sketch of his hanging body. This is Leonardo’s first extant sketch of the body of a criminal.”-(Azzolini 147). Leonardo di ser Piero da Vinci was a scientist, mathematician, inventor, anatomist, painter, sculptor, architect, botanist, musician and last but not least, a writer. Leonardo began apprenticing when he was 15 under the hand of sculptor/painter Andrea del Verrocchio of Florence. In 1472 Leonardo became a master in the guild of Saint Luke, wherein, members were artists and doctors of medicine. He was given permission to dissect human corpses at the Santa Maria hospital in Florence, and later in Milan and Rome. His Medical illustration career started shortly after he painted The Last Supper, in 1491. He began his anatomical studies by reading books in print. Then after noticing that none of the texts made any sense compared with his own observations, he decided to write his own. Leonardo started from the inside of the body to the external. starting with the bones, ligaments, muscles, tendons, nerves, veins, arteries and then the skin. This process was repeated for an elderly man, a younger man, and a child. He was specific in his measurements of everything, bone, and skin width and everything in between. He focused on individual parts rather than a full figured approach. He developed an under shading technique that allowed for him to accomplish the three-dimensional look that gave him the success he needed in order to create a realistic image of the human anatomy. He decided, rather than focusing on one figure from life, to draw collectively the examples he had seen to create the typical form of the human anatomy. Leonardo is credited with creating spacial relationships between skeletal muscle and the bones. He implemented the idea of origin and insertion, where the muscle attaches to the bone and what it helps to move. Da Vinci focused on the function of the body and depicted living figures to show physiology. He also reduced superficial muscles to show the underlying structures. Da Vinci also, incredibly, invented the use of a cross-section, to show the bundles of the muscle in relation to its placement with the bone. Sadly, Leonardo da Vinci’s works were circulated for a while after his death in 1519, but they were not published until the 19th century. 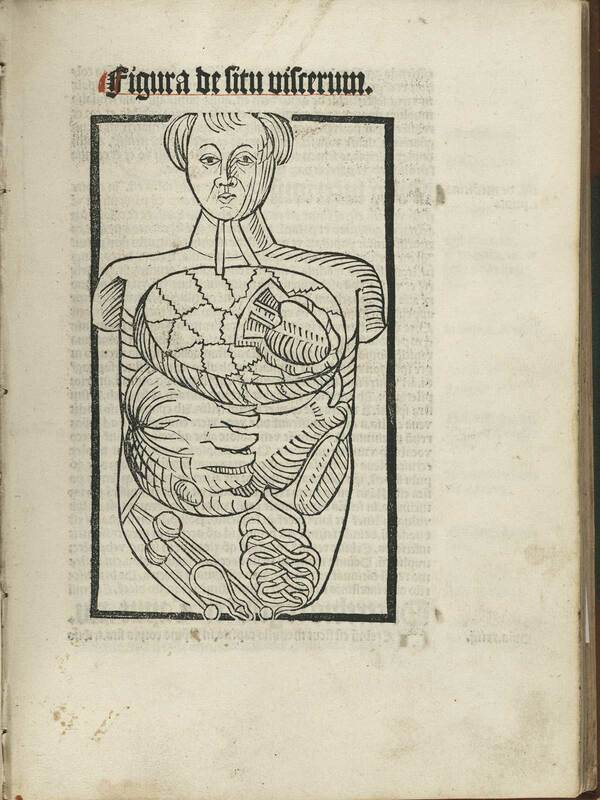 Gersdorff published his anatomical atlas in 1517 called Feldbuch der Wundarzney. The book was illustrated with woodcut works attributed to Hans Wechtlin. Gersdorff was one of the most noted German surgeons during the late fifteenth and early sixteenth century. However little is known about him. Hans Wechtlin was a renaissance artist who worked primarily in woodcuts. One attribution to this artist, though not depicted in this illustration, is the use of indication lines which, as previously stated, free up the image for more important things, such as the figure in its entirety. This image is impressive, in the massive culmination of weapons piercing through the figure’s body. There is no information, however about how one would go about removing them. Andreas Vesalius published the very first atlas of anatomy, De humani corporis fabrica, on the fabric of the human body in 1543. He is still one of the most influential men in medical illustrative history. “His work, De humani corporis fabrica, appeared in 1542. It was realized that if certain artistic holdings should be skillfully abandoned, greater scientific value could be achieved in the illustrations. Here we see the c-operation of the practitioners of medicine and art, each wiling to yield something so that greater teaching value could be attained.”(Loechel 170). Straying away from the gaudy frames rich with distracting portrayals of botanical blossoms, focusing now on the figure itself. Woodcuts, which had been utilized until this point were now seen as awkward and disruptive to the potential of the illustration. The new tool was Lithography. Lithography allowed for greater attention to detail in textures, colors, and depth. This allowed illustrators, physicians, and printers to produce medical books in a higher caliber. Juan Valverde de Amusco was Vesalius’s plagiarist. As success rained down on Vesalius’s work, it became apparent to Valverde that Vesalius’s work was a stroke of genius. All but four of the images in Valverde’s Anatomia del corpo humano, 42 in total, were directly taken from Andreas Vesalius’s De humani corporis fabrica. “Valverde admitted to having made use of Vesalius’s illustrations, and was explicit in his expressions of admiration for Vesalius’s achievement, while daring to put forward certain corrections.”(Ars Anatomica). Genga had a mind for classical medical texts, delving into Hippocrates’s works, and editing them too. Bernardino found himself engrossed in the preparation for anatomical specimens and felt a strong connection with the anatomy of ancient Greek and Roman sculptures. His fondness led him to the French Academy in Rome, where he taught anatomy to art students. 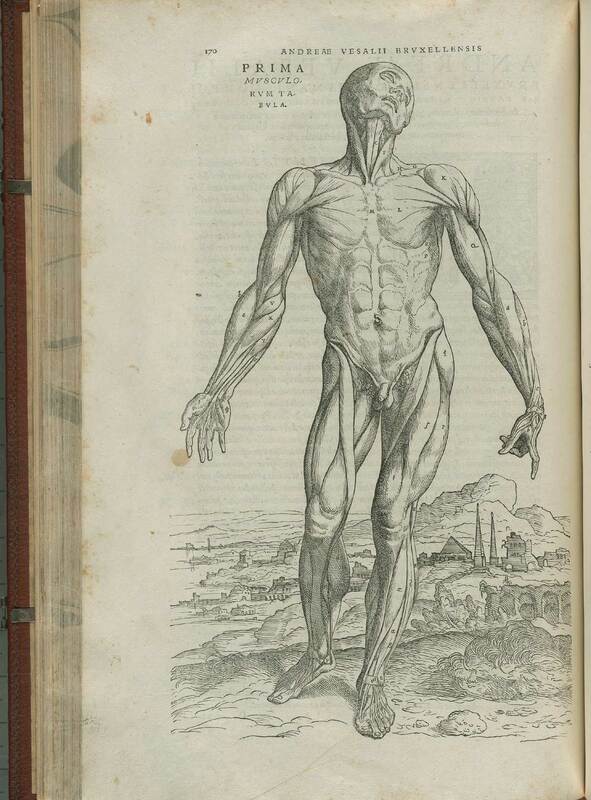 Bernardino published his works Anatomia Chirurgica, a textbook for surgeons, in 1672. His book had multiple editions, one titled Anatomia per Uso et Intelligenza del Disegno, which was published a year after his death. Bernardino practiced surgery in the Hospital of Santo Spirito in Sassia and died there in Rome. His anatomical preparations were rendered by artist Charles Errard, and these renderings were in the highest likelihood, engraved by Francois Andriot, creating the Anatomia per uso et intelligenza del Disegno, which translates to Anatomy for design use and intelligence. Giulio Casseri Studied medicine at the University of Padua, in Padua, Italy. He started as the servant to another student, do to his lack of family wealth, then moved on to serve Fabricius ab aquapendente, chair of surgery and anatomy. Following Fabricius’s death, Giulio Casseri took over his place. Then Adriaan van de Spiegel took his seat as the chair of surgery and anatomy following the death of Casseri’s death. Before his death, Giulio began to create an atlas of anatomy, which he intended to illustrate the entire body. However, his plans were ceased by a dying Fabricius in 1616 due to a rivalry between them. Giulio never finished his works but left behind a large number of engravings which were intended for his atlas titled Magnus Opus. Spiegel had spent his life creating an un-illustrated textbook, which upon his deathbed, was commissioned to be finished. German physician Daniel Bucretius took on this responsibility, purchasing a grouping of Giulio’s 78 engravings from his heirs. He commissioned another twenty engravings by the same artists’ student, Odoardo Fialetti (1573-1638), and engraver, Francesco Valesio. This image shows the artist, Odoardo’s understanding of perspective. The foreshortening in the left leg of the figure is an exciting image, as it displays the abilities of the Renaissance artist. The Naturalistic style has become the dominant style of illustration during this time, bringing clarity to the discoveries made by the physicians. This is not just a credit to the artist abilities to illustrate complex figures, it is a testament to the physician/ illustrator relationship. “The physician or anatomist of this period had a titanic job on his hands to find an accomplished artist who would undertake to work on cadavers. One must remember that here were no preservatives used, and it was therefore remarkable salesmanship on the part of the dissector to persuade an artist to devote time to anatomical material. Few understood it; few cared to understand it; but many had to eat so they became free-lance medical illustrators.”(Loechel 169). “For this end I employed an artist very skillful, both in drawing and engraving…For a great many years by-past, he has worked for very few besides myself; and for these last ten (most part of which he has been wholly employed in these tables) almost for me only. and he both drew and engraved them all by my direction. in the first place, I endeavored to make him understand, as well as possible, what it was to be drawn; and I was constantly with him, to direct him how everything was to be done, assisting him in the drawing, and correcting what was drawn. and thus He was instructed, directed, and as entirely ruled by me as if he was a tool in my hands, and I made the figures myself.”(Albinus). The artists were under constant control by the guiding hand of the physician. These artists were renowned for their abilities and their accomplishments in creating the exact thing in which the anatomist wanted. The artists who sought after the position of medical illustrator used a different term than what it is today. They called themselves natural philosophers. The natural philosopher of the eighteenth-century was controlled by patronage and attempting to distinguish themselves as true natural philosophers. However, due to the constant influence of the Anatomist, there was no credit issued to the artist of the anatomical atlases. Portrait from his anatomical atlas, from a portrait by Gerard de Lairesse, by Abraham Blooteling. “published in Amsterdam in 1685, containing 107 copperplate engravings. Like so many large and expensive anatomical atlases of the time, the work was not a financial success, and in 1690 he published a Dutch translation entitled, Ontleding des menschelyken lichaams, using the same plates.”(NLM). Neither of the editions sold well, so Bidlo’s publisher sold 300 of the extra printed plates to an English anatomist William Cowper. “Cowper published the plates with his own, English language text in Oxford in 1698 under the title, Anatomy of the humane bodies, without mentioning Bidloo or the artists of the original plates.” -(NLM). If you look down at the image below, you will notice that the image is the same, but the words in the circular section are both in a different font, and style. Bidloo’s version matches the style of etching used in throughout the rest of the image, whereas Cowper’s looks as if he wiped it away and stamped his information there. “A number of vitriolic exchanges took place between Bidloo and Cowper, including several pamphlets published in each anatomist’s defense. Cowper claimed, without much evidence presented, that the plates were not Bidloo’s at all, but that they were commissioned by Jan Swammerdam (1637–1680) and that after his death Swammerdam’s widow had sold them to Bidloo.”(NLM). This atlas was the first large-scale atlas since Vesalius’s De Humani Corporis Fabrica in 1543. “The images of the brain and the nerves were particularly useful to the seventeenth–century researcher and physician as they showed structures in much greater detail than would have been possible in a smaller book. However, the text came under considerable criticism, as it did not contain much explanation of the figures. ” (Swift). It was popular to use full-bodied figures in medical illustrations, but the level of detail would always decline. Though his atlas lacked a physiological description, the book worked well as a guide for surgeons to locate the specific muscle groups. 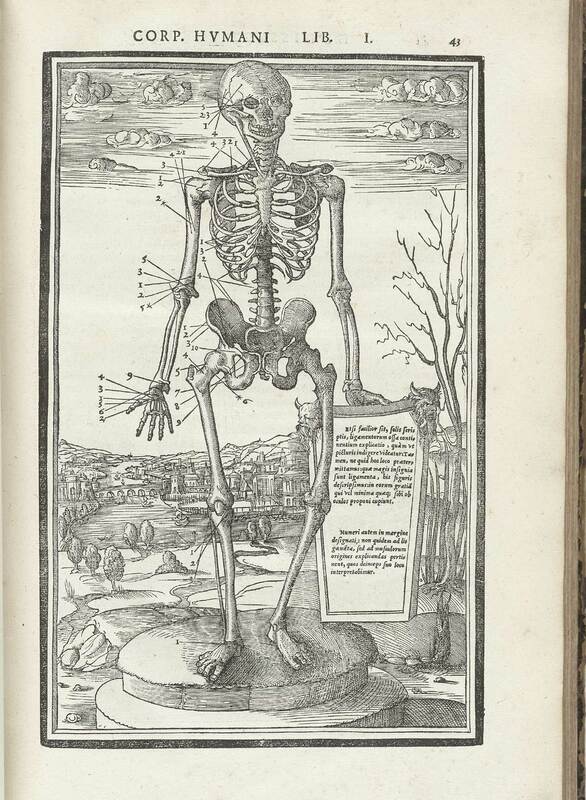 Indiana University published a site devoted to medicine and anatomy in William Harvey’s time, whom I will be mentioning at a later point in this paper. Wherein this sight an anatomist named Anton Nuck comments on Bidloo. Rembrandt’s portrait of Gerard de Lairesse at age 25, showing his saddle nose. Oil on canvas, ca. 1665-67. Metropolitan Museum of Art. “Anton Nuck described the work as follows: “that Mons. Bidloo, a skilful chirurgeon (Surgeon) of Amsterdam, had newly shewed him above 100 anatomical figures of the parts of a man as big as the life, ingraven on copper, with a description of the parts, but not of their use.” (Swift). 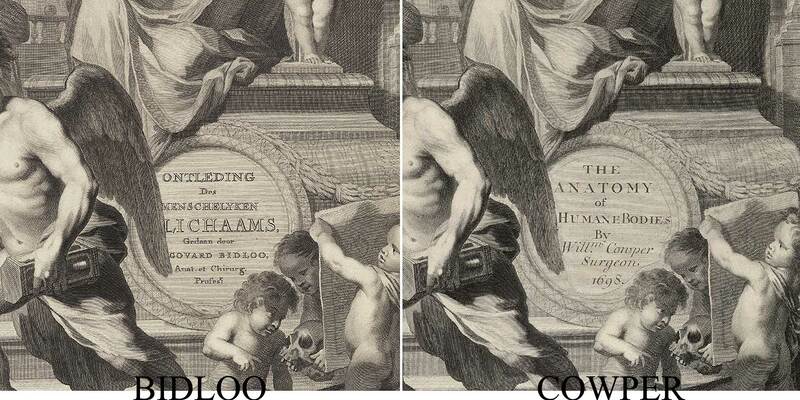 Bidloo was actually a huge success with his atlas, thanks to the skill of Gerard de Lairesse, and his two engravers Abraham Blooteling (1640–1690) and Peter van Gunst (ca.1659–1724). 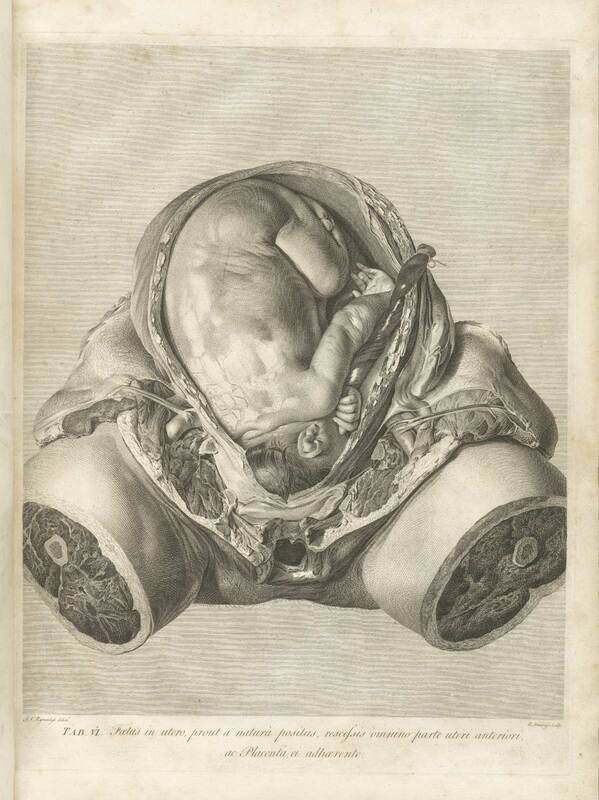 Rymsdyk was not a physician, he was the creator of William Hunters Anatomia uteri humani gravidi tabulis illustrata (The anatomy of the human gravid uterus exhibited in figures). He also was the leading artist in William Smellies atlas A sett of anatomical tables, with explanations, and an abridgment, of the practice of midwifery. He also did some illustrations for Charles Nicholas Jenty. The majority of Rymsdyk’s work was for physicians, a fate he seemed to have regretted. “Jan van Rymsdyk’s first assignment as a medical illustrator seems to be for William Smellie’s Sett [sic] of Anatomical Tables, published in 1754. This was a visual companion to Treatise of the Theory and Practice of Midwifery and contained 26 (out of 39) plates drawn by Van Rymsdyk. 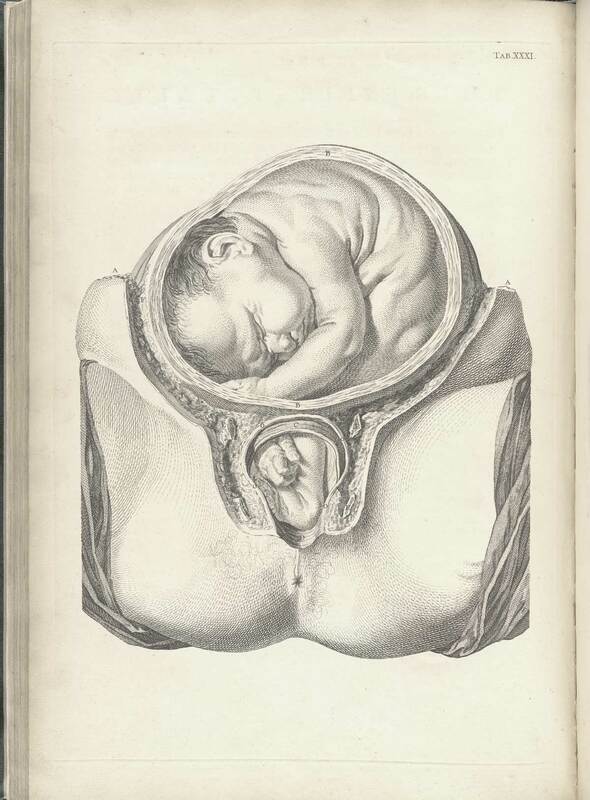 The plates are much more detailed an life-like than other more schematic illustrations of the era, and it was probably because of this assignment that William Hunter commissioned Van Rymsdyk to illustrate his great book on obstetrics.”(Horgmo). There was definitely something different in his hand. He illustrated for about 40 years and changed the course of medical illustration history. But he was never quite compensated for his time and talent, according to William Andrews from the association of medical illustrators. “For all the notoriety of this magnificent atlas, Rymsdyk was so miserably poor that he was glad to wear the cast off clothes of Mr. Wm. Baratt, surgeon. Rymsdyk also illustrated books by William Smellie, Charles Jenty and Thomas Denman. Thus, in a career spanning 40 years, this one artist illustrated the seminal works that became the foundation for modern obstetrics. Denman said of him, “There is so much truth and elegance in the drawings executed by Mr. Rymsdyk they may be considered as patterns for all future artists.”(Andrews). “Though the anatomical depiction of the 16th and 17th centuries tended to present whole bodies, often moving as though they were living, the figured in the 18th century (particularly female anatomies) anatomical atlases are often shown piecemeal, as parts rather than whole.”(Dittrick Museum). Over the past two decades, before Rymsdyk entered the scene, most illustrations were still typically full-bodied and lacked detail due to the size of it all. Rymsdyk’s work was really ahead of his time, paying such close detail towards his subject matter, and the accuracy. What we do know, is this; he illustrated the image with pastels, white chalk, and red Conte crayon, and then passed his masterpiece to the engraver who seemed to get all the credit. Though little is known about this man, we know he was dedicated to showing his impeccable craft through the hours he spent with a cadaver, still without the use of preservatives. Artist of the grand Gray’s Anatomy, probably the most famous of all the anatomical atlases out there, Carter found himself credit less at the end of this endeavor. “Having problems to finance his medical studies, HV Carter trained as an apothecary and later as an anatomical demonstrator at St. George’s Hospital in London, where he met Henry Gray (1872-1861), who was at the time the anatomical lecturer. Having seen the quality of HV Carter’s drawings, Henry Gray teamed with him to produce one of the most popular and longer-lived anatomy books in history: “Gray’s Anatomy”, which was first published in late 1857. The book itself, about which many papers have been written, was immediately accepted and praised because of the clarity of the text as well as the incredible drawings of Henry Vandyke Carter.”(MTD). The success of the book is credited to Carter’s Illustrations, but also the fact that they came from woodcuts, a fairly renaissance method of illustration. It was cheap, and simple compared with the newer technological advancements in photography. Henry Gray and Henry Vandyke Carter spent countless hours during those 18 months, working on the corpses of the poor who lived in the workhouses. A law was passed to stop “body snatching” a term that means stealing bodies from freshly dug graves. Unfortunately, there weren’t enough hanged convicts in England to supply all the young medical students, so the government passed a law allowed for bodies found in a workhouse, or hospital, of a person who has not enough to pay for their own funeral, will be used as cadavers for the medical students. This is where they found their subjects. Illustrations 190 and 219 from Gray’s Anatomy. “Throughout the creation of Gray’s, the two friends worked both separately (Gray on the text, Carter on the surgical anatomy illustrations) and as a joint enterprise; for a duration of at least 18 months they carried out the dissections on corpses from St. George’s Hospital and London’s workhouses, on which the text and illustrations were based. By necessity, the duo would have worked closely together on a daily basis in the dissection room at Kinnerton Street, in confined space for prolonged periods.”(Royal College of Surgeons of Edinburgh). Still, despite the success it received, Carter was left as the nameless contributor until 1901. This made him quite bitter towards Gray. There are currently 41 editions of Gray’s anatomy being sold all around the world. Gray’s anatomy was a success in their day and in ours. Very little is actually know about Joseph Vimont, except his studies at the Faculté de medicine de Paris, from which he graduated in 1818 with a dissertation on ophthalmia, extreme inflammation of the eye, especially conjunctivitis. However, it isn’t known how in particular Vimont got involved in Phrenology. Table 82 of Joseph Vimont’s Traite de Phrenologie Humaine et comparee, featuring the side view. The Brain is the organ of the mind. the mind is composed of multiple distinct, innate faculties. Because they are distinct, each faculty must have a separate seat or “organ” in the brain. The size of an organ, other things being equal, is a measure of its power. The shape of the brain is determined by the development of the various organs. As the skull takes its shape from the brain, the surface of the skull can be read as an accurate index of psychological aptitudes and tendencies. The 87th table in Vimont’s Atlas. Indicating the compartments in the skull. “Other movements can be said to have found their beginnings in phrenology, however, such as Broca’s studies of brain localization, the study of the human animal (anthropology), and the study of the “races,” which eventually led to many eugenics and ethnic purity movements. Indeed, Vimont’s own work compares the crania of people of various ethnicities, as well as people with various talents and personality disorders.”(NLM). Many works were published about phrenology, but Vimonts book was simply one of the best of his time. The title of Vimont’s atlas Traité de phrénologie humaine et comparée translates to Treatise on Human and Comparative Phrenology. It was illustrated by a countless number of artists, of which had great skill, but were never quite given the recognition they deserved. The only information that is available about the art produced is the lithographer who etched them for the publication process; Godefroy Engelmann. a franco-german lithographer created the 133 plates used in Vimont’s atlas. Engelmann died in 1839 from a tumor in his neck, in the same town in which he, was born in, the border of France, Germany, and Switzerland. In 1835 Engelmann went to Munich Germany to study Lithography, a German invention. Later, the following spring he founded La Société Lithotypique de Mulhouse, Lithotypic society of Mulhouse. He opened his own workshop in Paris in June 1816 and is largely credited with bringing Lithography to France. He even published his own treatises on Lithography called Traité de Lithographie. Max Brödel started out at the Anatomical Institute in Leipzig Germany, illustrating various bodily functions and organs. A famous physician, Carl Ludwig would approach him and urge him to the Institute of Physiology at the University of Leipzig. “With Leipzig an epicenter of medicine, Brödel met many visiting scholars, such as anatomist Franklin Mall, who urged Brödel to bring his talents to the new Johns Hopkins School of Medicine.”(The JHU Gazette). Max Brödel revolutionized the art as applied to science, creating the first medical illustration department. A book published about Max Brödel offers some insight on the father of Medical illustration, providing a charming description of the man who started a career that would change the world. The book titles Max Brödel(1870-1941) and underneath that, Director of the First Department of Art as Applied to Medicine in the World. As previously mentioned in a quote regarding Phrenology”…in and the study of the “races,” which eventually led to many eugenics and ethnic purity movements.”(NLM) Some views in science helped foster a movement with grim intentions. Germany during the 1870’s was fighting a major war between the Second French Empire and Prussian-led German Forces. This war caused much unification for Germany as a country, solidifying it while building tension and hostility which was a leading cause of World War One. This seems irrelevant for this discussion on Brödel, however, the information supplies an understanding of what is to come in the future of medical illustration. “Brödel was drafted into the army, November 8, 1890, to serve two years. Through the good offices of Geheimrat Carl Ludwig, Prince George of Saxony ordered that Brödel serve only one year with arms and that he devote the second year to artistic activity for the regiment. In 1892 Brödel returned to Leipzig to free lance in fine art and anatomical and physiological illustrations. Negotiations to come to America began in 1891 but because of misunderstandings, resulting from lost correspondence, Brödel did not arrive in Baltimore until January 18, 1894.” (CULLEN). Upon arrival, Brödel spent the next 17 years devoting his life to medical illustration as a prospective career. Paving the way for the young medical illustrator at Johns Hopkins University in Maryland, to help change the course of medicine and the method of teaching. He worked for three doctors Harvey Cushing, William Halsted, Howard Kelly. Brödel was an investigative illustrator. While working for doctor Howard Kelly, Brödel found himself putting tubes into a kidney to clear out the remaining fluids injecting the arteries of the kidney with red, veins with blue, and ureter with yellow. It is seen where the blood passes off in the glomerulus. Prolapsed kidney hung in suspension using the Brödel Suture. Brödel also created a suture that was known as Brödels Suture and commonly used for a prolapsed kidney. Brödel also invented a very important illustrating technique that has aided artist across the different artistic disciplines. The method was called the carbon dusting technique. It allows for all the vivid details of living tissue. It allowed for highlights, shadows, and textures. The printing presses were not quite capable of printing in color just yet, so Brödels technique helped elevate the detail of his illustrations. 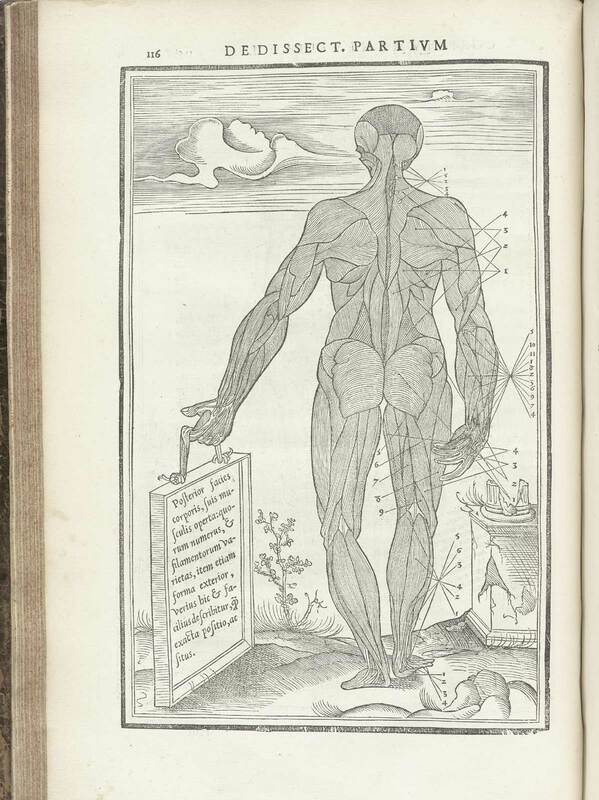 Most illustrators before Brödel had little understanding of biology, as we heard from Albinus previously during the discussion of the relationship between the artist and the anatomist. Brödel fully understood that there is a lack of the comprehension of a piece if the artist doesn’t understand what his subject is about. “The artist must first fully comprehend the subject-matter from every standpoint: anatomical, topographical, histological, pathological, medical, and surgical. From this accumulated knowledge grows a mental picture, from which again crystallizes the plan of the future drawing. A clear and vivid mental picture always must precede the actual picture on paper.”(Brödel). Brödel was an outstanding medical illustrator, however, He was a great teacher, and leader. His most significan legacy was creating the first school of medical illustration. Max Brödels’ students went on to form what stands today as the Association of Medical Illustrators, the hub for medical illustrators in the United States. They started their meetings in There are currently four schools on the North American Continent, previously there were five, however, one of the schools has left the pool. Each of the schools only has these programs because of Brödels teachings, for it was his five students who started the programs. The previous quote from the association of medical illustrators allows us to view the five major illustrators and professors as the founders of AMI. Eduard Pernkopf in academic regalia. Eduard Pernkopf was an anatomist at a time which is now a sensitive scar on world history. Pernkopf started out in life showing an interest in music, however, after the loss of his father, the village doctor, he found he was direly needed as a physician. He attended school at the University of Vienna’s medical school in 1907. He became a member of the Student Academic Fraternity of Germany. The group was strongly influenced by the German Nationalist persuasion. He received his degree in medicine in 1912, then for the next eight years he taught anatomy at various institution throughout Austria. During World War I, Pernkopf served as a military physician for one year. He returned home to Vienna and worked as one of Hochstetter’s assistants. Lecturing to first and second-year students on the peripheral nervous and cardiovascular systems and such. It wasn’t until he arrived back home in Vienna that he quickly rose through the ranks in academia. He became the Associate Professor in 1926, another two years he was a full professor. In 1933 He joined the Nazi Parties foreign organization. The annexation of Austria into the Third Reich known as the Anschluss was about the time Pernkopf became an SA, Storm Trooper. Previously, Pernkopf had formally succeeded Hochstetter as the Anatomical Institute Director in 1933, then became the dean of the medical school in 1938. He then held a position of power above the entire department. Requiring all Medical faculty to declare their ethnic lineage as either Aryan or non-Aryan, an action which provided the Nazi Regime with a list of those who refused to provide their ethnic background. This information dismissed 77% of the faculty. Automatically, all Jewish faculty was removed, as well as the list of those who refused to provide heritage. It is difficult to approach such a sore subject in a matter such as this, however, I feel that it is necessary to talk about this part of medical illustration history. Pernkopf and his Nazi Illustrators. Pernkopf published an atlas of his own in 1933, illustrated by his Nazi artists. It was called Atlas of Topographical and Applied Human Anatomy. The artists who featured their illustrations were Erich Lepier, Ludwig Schrott, Karl Endtresser and Franz Batke. “it is therefore within the individual user’s ethical responsibility to decide whether and in which way he wishes to use this book.” (Hildebrandt, 2006). Today, the officials of the Univerisity of Vienna are attempting to retrace the past and seeking buried information, in hopes that they might aid the next generation to approach these atrocities. Third generation students and scholars are morally outraged and seeking full access to the documents and locations of the victims’ remains. They hope to properly bury the victims and memorialize them. My favorite of all the Medical illustrators, Dr. Netter has illustrated over 4,000 illustrations to meet the demand of Doctors. He came across medical illustration due to his mothers wishes that he become a doctor. Little did she know, there was money to be made as an artist during the great depression. He started illustrating his studies and sometimes made some money illustrating commissioned pieces for his professors. He opened his own private practice in NYC, but continued his painting. One of the best misunderstandings that could have happened was a mishap on communication between an advertising manager and him. He was asking $1,500 for a series of five pictures, however, the advertising manager thought he meant $1,500 for each piece, so he bought the lot for $7,500. After that, Netter gave up the practice and continued as a medical illustrator. He started a relationship with CIBA a pharmaceutical company in 1936, illustrating a fold out human heart to promote the medicine Digitalis. He was also known for his part in advertising Novocain. But Netter created something far more important, his little green books. CIBA Frank H Netter M.D. Atlas of Human Anatomy 1989. His Atlas of Human Anatomy was published in 1989 and is considered a staple in medical education. Netter worked for the Ciba-Geigy pharmaceutical company producing captivating illustrations that would help to demonstrate how a specific drug worked. Frank H Netter M.D. Illustration of a Myocardial Infarction. Copyright Elsevier Inc. All rights reserved. Netter would spend most of his time researching his subject and planning how he was going to execute his illustration, but once he figured out how he wanted it, it didn’t seem to take as much time. He would start sketching in pencil, then he would copy it, and develop the image with watercolor and gouache, a thinker form of watercolor essentially. He would use opaque paints, colored pencils and pastel for the finished product, giving it the accuracy associated with Frank H Netter. One very important detail that is worth mentioning, is the text that followed the image. Netter did not write it directly onto the painting. He used a thin, plastic sheet as thin as paper called Mylar, and overlay it onto the image. This protects the original image as well as offers the artist a chance to change the position of the text and indication lines. Frank Netter provided the world with many illustrations to learn from and is the Michaelangelo of Medicine. In truth, it took until Max Brodel established his reputation 1894 to gain recognition for the study to become a true Discipline. But this Multi-disciplinary field had quietly and humbly existed without the implication of a title. Throughout medical Illustrative History, our understanding of the human body has grown and changed. The ability of the artists has transformed stiff squatting figures, into living beings with a window to their inner workings. Learning what works and what doesn’t with the scale of the figures, using part to part rather than a full figured model with little information to be seen. The technologies associated with printmaking and mark-making have developed into more intricate techniques that allow us to make illustrations that seem lifelike, rather than the primitive and crude misrepresentations. Such technologies like the Woodcut process, Lithographs, and modern printing, have formed an illustrative story about our evolution and our place in the world. The art styles Schematic, Semi-Schematic, and Naturalistic have evolved and can be utilized properly where they are needed. The wealth of information has accumulated enough for me to even create this document, though, from the earliest history, we are lacking in understanding the origin of some illustrations. Proportions have become more realistic as opposed to the awkward lumps and bumps in place of musculature. Indication lines applied rather than the distracting placement of text on top of the drawing itself. and the invention of Cross-sectioning, thanks to Da Vinci, has advanced our ability to communicate with the student, patient, and public. Medical Illustration was and still is an uncharted territory, with room for improvement and experimentation, granted not room for Pernkopfs experiments. The Disciplines found throughout this intricate history have presented themselves as important to the growth of this field. The contributions made by many of these illustrators and anatomists have been unparalleled in our ability to learn and thrive as a species. The constant questioning and pushing of boundaries have taught us that nothing is quite concrete, the truth is still out there. Who knows, maybe there is some truth behind Phrenology, and perhaps the four humors is a valid point to consider. There is so much more for the next generation of medical illustrators to document. New pharmaceuticals that have questionable side effects, dealing with today’s Opioid addictions, cancer research, and Alzheimers. We may look back at the groundwork that is laid for us, and learn from our curious ancestors. There is a wealth of information hidden in the decades that have come and gone. It is the future decades that will have to take the ancient and crumbling scripts endowed to us by our predecessors and find meaning when the present offers none. Always pushing to understand the greatest questions, Why? How? If this were to happen, then what? Communication is key in the field of medical illustration, so is our initial understanding of the subject. Extensive experience in artistic endeavors along with an understanding of aesthetics is crucial to achieving success in this field. Publication knowledge, Health promotion, Archeology, Anthropology, Chemistry, Linguistics, and Psychology add up to smooth and shape the field of Medical Illustration. But the greatest Discipline is a generous helping of curiosity. Givens, Jean A., et al. Visualizing medieval medicine and natural history, 1200-1550. Routledge, Taylor & Francis Group, 2016. BERKOWITZ, CARIN. “The Illustrious Anatomist: Authorship, Patronage, and Illustrative Style in Anatomy Folios, 1700–1840.” Bulletin of the History of Medicine, vol. 89, no. 2, Summer2015, pp. 171-208. EBSCOhost, search.ebscohost.com/login.aspx?direct=true&db=aph&AN=103361415&site=ehost-live&authtype=sso&custid=plymouth. Douma, Michael . “Prehistory.” Pigments through the Ages – Prehistory, Institute for Dynamic Educational Development, Jan. 2008, www.webexhibits.org/pigments/intro/early.html. “WILLIAM CHESELDEN (1688-1752) -ANATOMIST, LITHOTOMIST, AND SURGEON.” JAMA, American Medical Association, 31 Aug. 1963, jamanetwork.com/journals/jama/article-abstract/666632. “Historical Anatomies on the Web: Browse Titles.” U.S. National Library of Medicine, National Institutes of Health, 12 Dec. 2016, www.nlm.nih.gov/exhibition/historicalanatomies/browse.html. State of Texas, University of Texas Health Science Center at San Antonio Library. “Treasures of the P.I. Nixon.” UT Health Science Center Library RSS, 17 Mar. 2017, library.uthscsa.edu/2012/04/plagiarist-of-the-past/. “History – Historic Figures: Galen (C.130 AD – c.210 AD).” BBC, BBC, www.bbc.co.uk/history/historic_figures/galen.shtml. Andrews, Bill. “Concurrent E: Jan van Rymsdyk: The Artist Who Created Obstetrics.” Association of Medical Illustrators , 2017, doi:10.1075/ps.5.3.02chi.audio.2f. Horgmo, Oystein. “Jan van Rymsdyk – Drawer of Wombs.” The Sterile Eye, Oystein Horgmo, 21 Mar. 2010, sterileeye.com/2010/03/19/jan-van-rymsdyk-drawer-of-wombs/. Schillace, Author Brandy. “Anatomy Artists: William Smellie, William Hunter, and the work of Jan van Rymsdyk.” DITTRICK Museum Blog, 6 Aug. 2013, dittrickmuseumblog.com/2013/08/01/anatomy-artists-william-smellie-william-hunter-and-the-work-of-jan-van-rymsdyk/#_ednref3. McFall, Kathy Jane. “A Critial Account of the History of the Medical Photography in the United Kingdom .” IMI Fellowship Submission, June 2000. Novella, Steven . “Phrenology: History of a Pseudoscience.” Phrenology: History of a Pseudoscience | The NESS, The Ness , Mar. 2000, theness.com/index.php/phrenology-history-of-a-pseudoscience/. Wyhe, John van. “The History of Phrenology.” The History of Phrenology, Cambridge University , 2000, www.victorianweb.org/science/phrenology/intro.html. Miranda , Efrain A. “Henry Vandyke Carter, MD.” Henry Vandyke Carter, MD, Medical Terminology Daily , 27 July 2015, 7:00, www.clinanat.com/mtd/758-henry-vandyke-carter-md. Donald, Gabrial . “The history of medical illustration.” Taylor & Francis, Journal of Audiovisual Media and Medicine, 10 July 2009, www.tandfonline.com/doi/abs/10.3109/17453058609156023?src=recsys. Hajar, Rachel. “Medical Illustration: Art in Medical Education.” Heart Views : The Official Journal of the Gulf Heart Association 12.2 (2011): 83–91. PMC. Web. 11 Dec. 2017. Loechel, William E. “The History of Medical Illustration.” Bulletin of the Medical Library Association 48.2 (1960): 168–171. Print. Netter, Francine M. “Francine Mary Netter.” FRANK H. NETTER, MD, Quinnipiac University Press, www.frankhnetter.com/?page_id=30. Sheir, David N, et al. Hole’s Human Anatomy & Physiology. 13th ed., McGraw-Hill Companies, 2013. “Learn About Medical Illustration.” Association of Medical Illustrators, Association of Medical Illustrators, 2017, ami.org/medical-illustration/learn-about-medical-illustration. “HUNDT, Magnus, the elder (1449-1519). Antropologium de hominis dignitate, natura, et proprietatibus de elementis. Leipzig: Wolfgang Stoeckel, 1501.” Christie’s, Christie’s, 5 Oct. 2007, www.christies.com/lotfinder/Lot/hundt-magnus-the-elder-1449-1519-antropologium-de-4959861-details.aspx. Medical illustration is a tool to help learn. It is more than a beautiful picture, it is a practical image. I also wanted to promote the idea of interactions across majors to help promote our ability to communicate and induing so, our understanding of our own studies. I had everything I needed to photograph a body in motion. I met with the Dance Team, run by Amanda Whitworth, under the agreement that I had cart blanch of the room to photograph. But every shot I took, I felt as if…I did not know how to use the camera. Out of the 382 images, I couldn’t make one work. However, I realized later that I have a cousin who happens to be a ballerina…who has professional photos of her dancing around Boston on her pointe shoes. She has been dancing with Kathy Blake Dance Studio since she was a child, here is a link! I could not have had a better opportunity. She agreed, and I got to work. Another setback I experienced was my ability to complete an illustration in time to display it in its own exhibition. I had originally planned to illustrate one image a week, which I now realize is impossible. Despite my difficulties with this project, I pulled through it and learned quite a bit. I started out illustrating the original image, which is above. I had to use an old Opaque projector which, as amazing as it is, was very old, and needed the photo to be smaller to fit on the size paper I bought, 18×24 watercolor paper. So I had to double up the paper, taping the two together. Luckily I’m not a professional illustrator yet, so the judgments I received for doing so, weren’t that bad. The initial projecting and pencil tracing took a whole 3 hours. Trying to read the fuzzy projection and distinguishing the various muscle groups, it seemed to take forever. But once I had the value structure established, locating the muscles was easier. The pencil marks had to remain light or the marks would be too heavy and show through my watercolor. Then began the arduous process of mapping out the muscles. I used my copy of Frank H Netter’s Atlas of Human Anatomy, and my anatomy book Hole’s Human Anatomy & Physiology thirteenth edition, by David Shier, Jackie Butler and, Ricki Lewis, This is a link to an old edition. Trying to draw muscles when the leg is rotated medially (towards the inside of the body) was quite difficult. I had to use my imagination a bit in order to map out her musculature. Eventually, the muscles surfaced and I had my blueprint. I was terrified to go from here though. I loved the initial image so much that I dragged my feet in applying the paint. I started light and began with her upturned foot, slowly trying to make the right shade, but once I started painting, I had little fear to move on to the leotard. Her face was incredibly hard to capture. It truly is the hardest to paint an image of the people you know the most, you keep seeing their face in the way you have seen it through your life. In this case, I always saw Chelsea as the little girl dancing in a tutu on stage. I put my differences aside with the face and started erasing the groundwork of the leg muscles. I left a residual opaque trace of my initial pencil guidelines. Before I started painting, I looked through my frank Netter book for advice on how to apply a reasonable color. Frank Netter used a light pallet of pinks and little red highlights. Then there was just me and Frankie (my pet name Frank Netters Atlas of Human Anatomy), on the floor of my living room. I was so tired, I could have sworn Netter was talking me through the steps. I tried to stay true to his style of painting, but instead, my hand surfaced. By this meaning, my style surfaced, and I felt some confidence in my brush strokes. Each section had its own direction, which displayed its function. A tip from a friend who is a Nursing major helped me establish the tendons and ligaments. Structure of value using watercolor. She suggested that I put blue as an underpainting and overlay it with white. I still question if she’s in the right major. As the image began to blossom, so did my confidence. I felt as if I could wake up every day and do something like this, It felt right to me. It has its challenges but they are problems I (unlike college algebra) want to solve. The applied piece almost complete. Upper and lower Leg Illustrations by Trysten Bewersdorf 2017. Jackson Musgrave lifting a kettle bell. finishing this one, and, as an afterthought, I will do one more. I plan to finish this with one more drawing displaying the back muscles. This Applied piece helped me realize, THIS is what I want to do for the rest of my life. I found myself comfortable with the daily task of studying, and painting. I actually had a few second thoughts on this project. I considered making them smaller, and less detailed. I considered learning how to create woodcut prints and dabbling in Lithography. My original idea was to create a three-layer illustration using a type of paper called mylar, which is a clear plastic sort of surface which would look quite interesting if I had only known what sort of medium to use. But despite these second thoughts, I am proud of what I accomplished. I also learned a few tricks during my research essay, that helped me along my process. I learned that some medical illustrators use colored pencil and white chalk to help establish the parts of the muscle that watercolor and gouache cant establish. As for my interdisciplinary studies program, I feel that I have grown during this project. I found myself challenged at every corner and happily pushed through it to find a solution. I’m glad for the experience, and the opportunity to work among the different majors; Fine art, Art History, Anatomy, Communication, and Photography. I have successfully created a piece of medically illustrative art, that communicates anatomy and physiology, which can be used to teach, and study. I feel that I completed my goal, however how small the scale I have ended with. I consider this project to have been a success, as has this year in my endeavors in Interdisciplinary studies. Netter, Francine M. “Francine Mary Netter.” FRANK H. NETTER, MD, Quinnapiac University Press , www.frankhnetter.com/?page_id=30. Pernkopf-Nazi Doctor, and Medical illustrator. There is a famous Medical illustrator in history, who found himself rising among the ranks of Hitler’s Doctors and Scientists. Eduard Pernkopf (1888-1955) was an anatomist at a time which is now a sensitive scar on world history. Many argue whether it is ethical to use the book created by a man who performed dissections on the victims of his Nazi Regiment. Today, the officials of the Univerisity of Vienna are attempting to retrace the past and seeking buried information, in hopes that they might aid the next generation to approach these atrocities. Third generation students and scholars are morally outraged and seeking full access to the documents and locations of the victims’ remains. They hope to properly bury the victims and memorialize them. Sources: “1933–1953: Eduard Pernkopf’s Atlas-.” AHRP, AHRP, 31 Aug. 2015, ahrp.org/1933-1953-eduard-pernkopfs-atlas-of-topographical-and-applied-human-anatomy-a-tainted-beauty/. Riggs, G. “What should we do about Eduard Pernkopf’s atlas?” Academic medicine : journal of the Association of American Medical Colleges., U.S. National Library of Medicine, Apr. 1998, www.ncbi.nlm.nih.gov/pubmed/9580714. the image. The block of wood on which the image is carved into is called a matrix. The matrix is used for mass reproduction of that image. There are different ways in which a final image can be pressed, Stamping, Rubbing, and Pressing. Stamping was the original method employed during the Renaissance. The ground medium is the paper or fabric on which the image was printed. The ground medium was placed flat on a surface, the woodcut matrix was inked up, and placed onto the ground medium, then pressed leaving an impression and the mirror image of the wooden matrix. Rubbing was a widely used method in China and Japan and later became very popular in Europe. It was the opposite of stamping, as the matrix was placed face up. Paper or fabric is then placed on the matrix, and the back of it is rubbed with a piece of wood or leather, known as a Frotton. The tool is now called a baren. The pressing method is a little more complex. A large cylinder is attached to a table and the cylinder is moved by a system of gears activated by rotating a hand-crank. The process became more complex through time. The woodcut process was advancing. to the end of the 15th century, when Johann Gutenberg developed a better method of printmaking; the printing press. It is argued that Woodcut was an inferior method of printmaking. However, if we look back at our favorite medical illustrator whose name is more recognized due to a popular show. It’s Grays Anatomy, the top-selling book that was made with cheaper materials, but the images were still beautiful. In case you haven’t seen one in figure two you will see a beautiful illustration by Henry Gray’s artist, Henry Vandyke Carter. Little known fact about this work is that these were made with woodcuts. Even though there were better methods of creating such detail, the two Henry’s stuck to a cheaper process, which, in the end, brought fame and fortune to them both (except Carter, he didn’t get credit until about 1901). As an art thought, Woodcutting is really quite beautiful. It may lack the soft edges of a printing press, or the detail you would see in a Lithograph, but woodcuts have a subtle grace about them. I took a look at some of the different styles of woodcuts that have been produced in the past, and I find myself in awe of these artists and their ability to mimic and distort their surroundings. A famous woodcut artist is Albrecht Durer, a German artist from 1471-1528. Following my curiosity, I was led straight to Durer, his ability to manipulate his media to create images as clear as his Rhinoceros from 1515, which can be seen in figure 3. This print is very detailed, I would argue that woodcuts make for an impressively accurate reproduction, though there are many different processes which make a different image. Printmaking, using woodcuts is such an ancient process. It is still used by artists and students today, but none have mastered the quality of Durer or Carter. Frank Netter was an artist at birth, “As far back as I can remember, ever since I was little tot, I studied art,”-(Netter). However, during the Great Depression, Jobs were seemingly sparse. So Netters family urged him to study Medicine. Taking their advice, Netter went to medical school at the City College in New York. He found himself illustrating his studies, and interested his classmates and maybe a teacher. Little did his mother know, there was money to be made as an artist during the great depression. He opened his own private practice in NYC but continued his painting. One of the best misunderstandings that could have happened was a mishap on communication between an advertising manager and him. He was asking $1,500 for a series of five pictures, however, the advertising manager thought he meant $1,500 for each piece, so he bought the lot for $7,500. After that, Netter gave up the practice and continued as a medical illustrator. He started a relationship with CIBA a pharmaceutical company in 1936, illustrating a fold out human heart to promote the medicine Digitalis. He was also known for his part in advertising Novocain. But Netter created something far more important, his little green books. His Atlas of Human Anatomy was published in 1989 and is considered a staple in medical education. Personally, I own a copy of Atlas of Human Anatomy. It was gifted to me by my doctor. During my senior year in high school, I found myself drawing out the muscles and bones, studying for anatomy, much like Frank Netter. I found that I enjoyed art, but it was the science that thrilled me. Currently working on my applied piece, I am reading through his book, and learning how to create the strokes that bring this piece of paper to life. I definitely could take a page from his book. I have discovered an amazing video that helped me immensely with my research! Benjamin Mandel MD talkes about the medical illustrative history from Antiquity to the famous Max Brodel. The video taught me quite a bit about the style of medical illustration and how it has changed over the years. Starting with the 13th century illustrations, here is a photo I found on Wikipedia. images like this one (showing the veins in the body) typically have religious scripture attached to it. This image was found in a Medieval or Renaissance manuscript, and it originated in England. The problem stylistically is that this illustration is hard to read. I don’t mean in the sense that it is in Latin, and that it is small print, I mean that there is too much going on here. It would be difficult to use this illustration to find these veins when there is no context as to where they would be in relation to the rest of the internal organs. The abilities did get better, like in this photo of the wounded man. The wounded man was taken from a field study on The Method of Curing Wounds made by Gun-Shot. It was used to demonstrate wounds in surgical texts throughout the sixteenth and seventeenth century. It was originally printed in Johannes de Ketham’sFasciculus Medicinae (Venice, 1491). The problem with this full body style is the lack of detail in the actual body parts that are damaged. Another problem with the full body style is that they often propped the subject up on a stool, and the subject (thank god) was dead and very stiff. This image is by Hans von Gersdorff, from the field book of surgery and is showing the points for blood letting. It wasn’t until Magnus Hundt of Leipzig Germany And German engraver Hans Wachtlin, who’s images are difficult to find. Why these illustrations worked was the break down of the figure. The close up of the organs allowed for more detail and a better understanding of its context within the body. Stay tuned for more next week in the break down of Medical illustration history! Some of the articles I have been reading literally astonish me. Like in an article by Willam E. Loechel the History of Medical Illustration I learned that there was no preservative during the renaissance, so the dissectors of that time were like salesman, trying to convince an artist that illustrating the dismembered body was worth their time. Many artists didn’t want to do this, I don’t blame them, the bodies were slowly rotting before their eyes. But some artists had to take up this opportunity because, well, they gotta eat somehow, and there wasn’t many more options available at the time. There were some though, that decided to take on this challenge to gain a better understanding of the human body to help with their future paintings. Another fun fact I learned in the same article (the guy was good) was that much of the art produced for this task was not as a painting, or even a drawing, it was done in etchings. An etching is like a shallow carving on wood, metal, or stone, that was inked up with various colors and then laid on a piece of parchment and pressed. One of the difficult things about this process is that the image has to be carved on backwards because the print will be the mirror of the image created. It sounds difficult, but the reason they did this was so that they could print the image as many times as they needed to in order to illustrate many pamphlets as the dissector decided was necessary. I learned in another article titled Medical Illustration: from caves to cyberspace by Jenni Tsafrir and Avi Ohry about THE first medically illustrated image. Picture yourself somewhere near the town of Pimiango near the border of Cantabria in northern Spain. You walk around a rocky coast to find yourself staring into a cave. The cave is small, and it would likely be a child who had the upper hand in crawling into a space this small. But there on the cave wall, you see THIS! Written on the cave wall in red ink is the Mammoth in red, found in Cueva del Pindal. This was likely used to teach young hunters that the marks above the shoulder is where it is best to shoot the beast with your spear, the heart. So there it is, the first medical illustration that the world has ever seen. I read in a book some troubling information that could possibly hinder my ability to document the medical illustrators in history. The book is Visualizing medieval medicine and natural history, 1200-1550, by Givens. This book in the first paragraph reported that many of the medieval texts did not have authors. The might even have been written for the scribes themselves, meaning there is no where to give credit where credit is due. There were also no medical illustrators, just artists who were hired to do a job. There isn’t much of a story to follow up until Andreas Vesalius, a man from the Netherlands in 1514 wrote the first atlas of anatomy called De Humani Corporis Fabrica, or on the fabric of the human body in 1543. but from then on, we had da vinci, frank netter, and many more. So that’s my little bit to share with you so far in the medical illustration news.